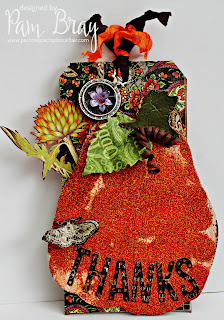 Pam Bray Designs: A Girl with Flair: Give Thanks Tag with Emerald Creek Supplies Dare Challenge! Give Thanks Tag with Emerald Creek Supplies Dare Challenge! If you are here to see the details on my Graphic 45 "Wicked" Sign you can find them HERE!!! I hope you are ready for the next "DARE CHALLENGE" on the Emerald Creek Supplies Blog. The next challenge is "Give Thanks" since we are heading into fall and of course Thanksgiving! So get your creative hats on and share with us your "Give Thanks" projects by linking them up on the Emerald Creek Supplies Blog!!! Begin by die cutting the Pumpkin Jack from chipboard. Apply Weathered Wood over pumpkin; dry completely. Paint Crackle Paint to prepared paint; dry completely. Apply Boss Gloss or VersaMark over top of prepared pumpkin and stem. Sprinkle Thanksgiving Embossing Powder over pumpkin; heat set. Sprinkle Moss Green Stone Embossing Powder over stem; heat set. Apply Ripe Persimmon Distress Ink over top of prepared pumpkin. Die cut tag from chipboard. Adhere pattern paper and fussy cut flower to chipboard tag. Adhere prepared embossed pumpkin and stem to top of tag. Adhere die cut leaf to top of pumpkin. Die cut "Thanks" letters from pattern paper. Adhere to top of pumpkin. Twist wired brown jute around small dowel. Glue to top of pumpkin. Add pattern paper to Small Cameo Charm along with small fussy cut flower to the center. Tie to seam binding to top of tag. Add fussy cut moth to top of pumpkin. Remember to follow the challenge rules as posted on the right sidebar of the blog, in order to be eligible. Beautiful tag Pam! All those layers on the pumpkin are amazing. Love the little flower you added to the charm! 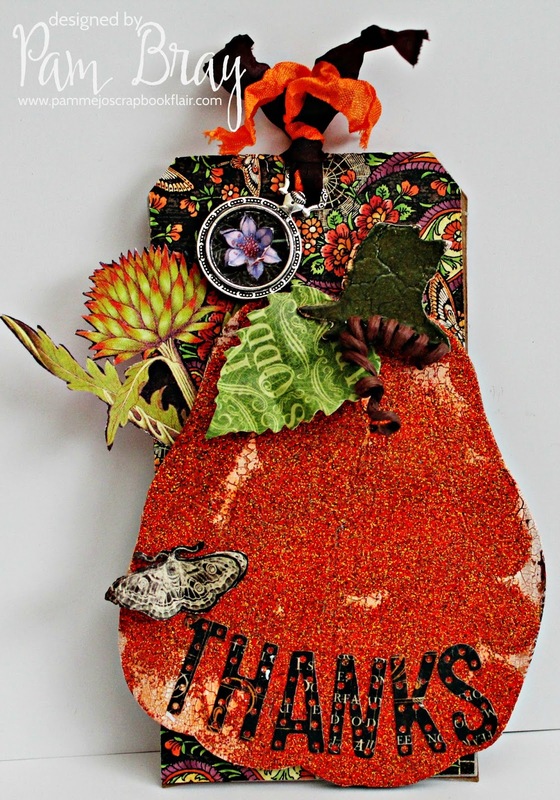 Pam, your Thanksgiving tag is truly beautiful! I love the way you gave your pumpkin a realistic look, as if it's been ripening in the fields over a hot summer. The paper you chose is a gorgeous backdrop and your charm looks fabulous on top! Big hugs! Wow Pam! I had no idea you could get so much powder into 1 project. This looks fabulous! Awesome job. Fabulous job Pam! Love how your pumpkin turned out! !